Besides advances in durability, there’s now an expansive range of styles that designers can tap in to. Think velvet cushions. Tailored detailing. Rich, soft upholstery. Lacquered or carved artisan-made furniture. And lots of other high-end elements that bring the elegance and sophistication of a richly finished interior to a home’s outdoor space. The collection’s aluminum frames are hand-cast in sand using a process that eliminates air pockets, making the material nearly as solid as iron. Frames accented with artisan-applied brass details cradle deep tailored cushions, and the pieces are crisply done in Butera’s signature navy and white. Prices tend to reflect the luxury features. Butera’s three-seater sofa lists for around $5,000. Vondom collaborates with international designers and architects on high-concept resin decor with an edge. That includes Ramon Esteve’s geometric Vela collection, which uses LED lighting in the bases, so seating and tables seem to float slightly at night, to ethereal effect. Planes and angles create sculptural pieces of art that are also a sunchair, bench and planter. Also at Vondom: Teresa Sapey’s Adan collection of giant faceted heads has an Easter Island vibe. And ultramodern chairs by designers Eugeni Quitllet and Jorge Pensi are cloaked in gleaming gold or silver, combining avant garde with elegance. Tropitone’s Cabana Club collection blends woven, metal and upholstery elements in roomy, contemporary seating inspired by luxe resorts in Bali and the Cote d’Azure. CB2′s new outdoor collection includes Ceci Thompson’s French Riviera-inspired mahogany and cabana-striped sofa. A daybed poises slim cushions on an iron frame given a rich golden glaze. European midcentury modern looks are also finding their way outdoors. For Gloster, Petersen’s chic, minimalist Blow side table perches a sliver of teak on a smoke, coffee or emerald-hued ceramic base. And Cecilie Manz’s Atmosphere collection pairs a curvy, powder-coated aluminum frame with a slim teak seat, then pads the sofa and chair backs in hues like nightshade, salmon, quince and lichen. 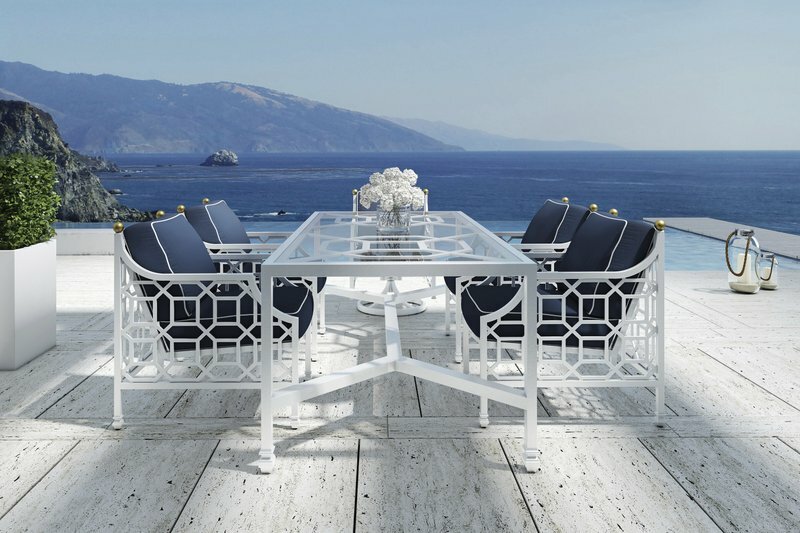 For those seeking a more traditional look, Richard Frinier’s Archipelago collection for Century features richly carved and stained teak seating and tables that evoke British and Dutch Colonial style. The new Lilly Pulitzer collection at Pottery Barn includes the designer’s signature preppy-nautical prints on outdoor soft accessories, and crisp, white, trellis-patterned planters. Many designers’ patterns dispel the notion that outdoor furniture should be printed with tropical motifs. Brown Jordan’s Suncloth fabric collection includes menswear-style houndstooth, tweed and even sweater prints. Elaine Smith, a former jewelry designer in England, now designs runway-inspired luxury outdoor pillows. On solution-dyed Sunbrella fabric that resists fade or mildew, she incorporates dressmaker details like silky fringe, hand-crafted knots and jewelry embellishments. Her patterns range from jaunty nautical motifs to animal and tribal prints to florals. Sunbrella’s Makers Collection includes weather-resistant fabrics that evoke fine wools, hand-loomed Peruvian cottons or metallic-thread linens. Other outdoor fabric houses are being inspired by antique tapestries, quilting or Japanese kimonos. And some are using specialty yarns to create sumptuous pearlescent or silken textiles that withstand the elements.